Remove the lollipops from their original wrappers. Open the Pop Rocks and pour them in a shallow bowl. If your lollipops are not sticky enough on their own, dip them quickly in plain water. 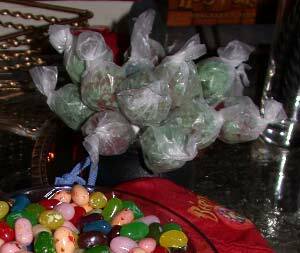 Roll the lollipops in the Pop Rocks until they are completely covered. Wrap them in plain wax paper squares. The Pop Rocks immediately start losing their "pop" when in contact with the moisture in the lollipops, so assemble these as close in time to serving as possible for the best effect. Britta's recipe was taken with permission from britta.com.